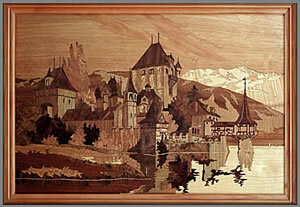 March's update brings you two wonderful examples of Buchschmid and Gretaux Wood Inlay applied pieces. We have a superb rectangular coffee table which we know you will thoroughly enjoy looking at and admiring, plus we also have what is now a rare Buchschmid and Gretaux tea tray. Both pieces are pefectly delightful and superbly decorative in their own right. Our March update as we say, brings you two examples of Buchschmid and Gretaux wood inlay decorated furniture and table accessories. The first example we will look at is the B & G coffee table seen here on the right. it is titled 'Four Seasons Coffee Table' and depicts rural activities associated with the four seasons of the year. This table is only the second example we have seen of these rectangular B & G tables, so we certainly wouldn't say they are that plentiful. If you have one, do take good care of it as these pieces are now irreplacable. The 'Pear' and 'Kidney' shaped B & G tables were produced in greater numbers, but even then, there are still not that many of them around. So, as we say, if you own any of these B & G pieces do treat them with care and keep them out of strong sunlight and hot dry atmospheres. 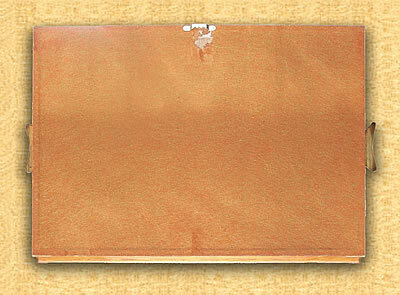 Our second Buchschmid and Gretaux piece for March is a wonderful example of a B & G wood inlay decorated tea tray. 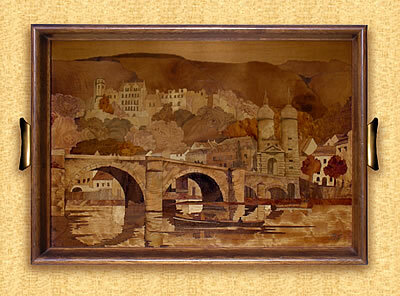 This tea tray features a favourite decorative scene of Buchschmid and Gretaux, this being a view of Heidelberg from across the river. You don't see many of these with their original handles intact - quite often many of these get converted into wall hanging pictures. But in this case the owner, Andrea's tray not only has the handles intact, but the scene of a view of old Heidelberg is still looking as fresh and vibrant as the day it left the Buchschmid and Gretaux Wood Inlay Works. The original information label pasted on the rear of the tray has obviously been worn away over its long life, but some remnants still remain of that original label. As you can see, a hanging arrangement has been tastefully added - and as it is only affixed to the 'frame' of the tray rather than burrowing into the picture element, the original wood inlay artwork is not damaged in any way. Although a little hidden and slightly indistinct, the all important BG logo is fully inplace in the customary lower right hand corner of the picture. 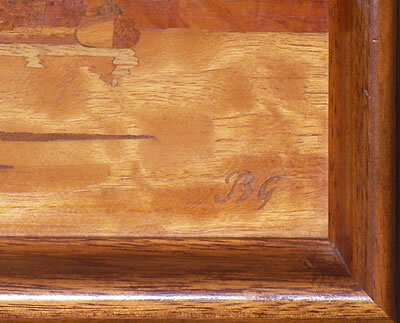 The BG logo and the rear label are the main indicators of a genuine B & G Wood Inlay piece. Over the years there have been attempts to try to replicate B & G pieces, but like Stradivarius violins, there are elements to these pieces that make them unique. The veneers, the cutting and the varnish mixture used are B & G specialities which, in the eyes of an expert, single out the genuine BG pieces from the also rans. A web visitor has asked if we know if there is a copy of the above B & G picture available for sale. If you have one of these Oberhofen Castle pictures and you would like to consider selling it, let us know and we will put you in touch with our enquirer. Please note that we do not (and will not) act as a broker for such sales, we occasionally pass on details of such enquiries as a courtesy to our web visitors so that they can conduct their transactions on a one to one basis with their particular buyer or seller. 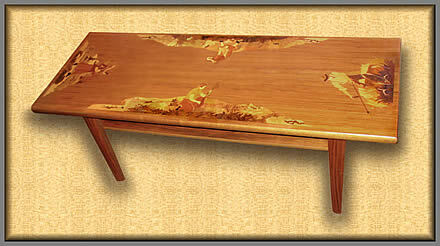 Another question, has anyone heard of Marquetry artist David Owen? If you have, or indeed you actually are David, could you get in touch with us, thanks. Click the above button to return to page 44 of "Can You Help"